BrightPay provides a quick and seamless import utility to bring across your company and employee details from Moneysoft at the start of the tax year. Please note: this import utility will import basic employer, employee and subcontractor information. It must be noted that it does not perform a comprehensive import and is thus not suitable for anyone migrating to BrightPay mid tax year. 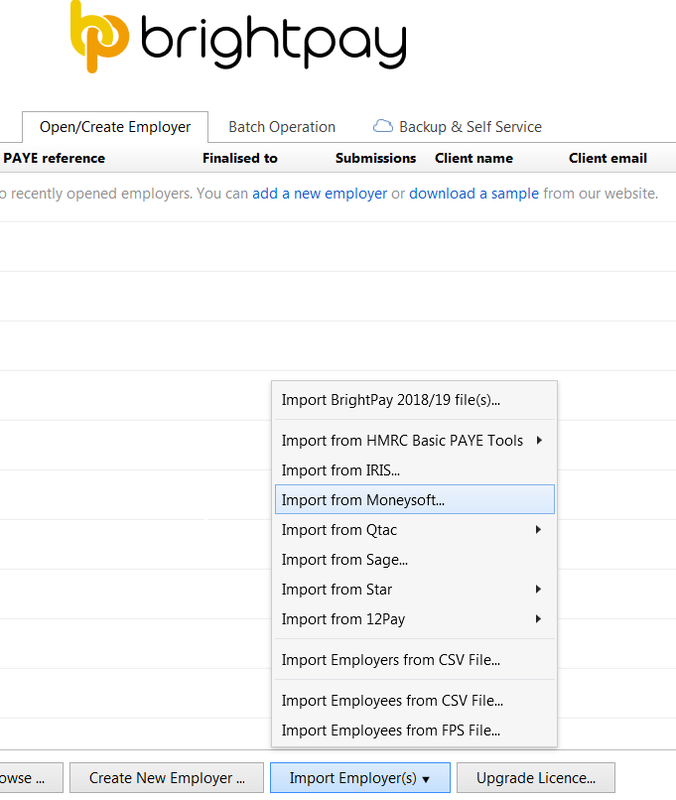 For a more comprehensive import option for a mid year migration to BrightPay, please see the support section on 'Importing from Moneysoft using a CSV file (mid year)'. To begin the import, simply click on the ‘Import Employer’ button at the bottom of the ‘Open Employer’ screen and select 'Import from Moneysoft...'. Browse to the location of your Moneysoft company file. The default location is typically 'My Documents > Payroll'. The file to select will be titled 'yourcompanyname 2018-19.pay'. Click 'Open' to begin the import. Following the import, further employee information can be manually entered within 'Employees', if required. It is also recommended that all employee details are reviewed before processing any payroll to ensure information imported in is correct and applicable for the tax year in question e.g. employee tax codes etc.